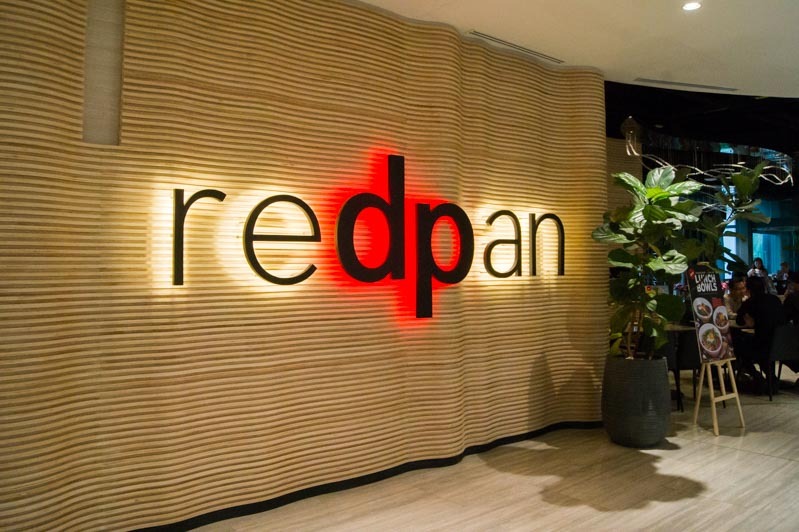 Redpan is the brainchild of home-grown architecture firm DP Architects, the good people behind GRUB, and The Food Explorer Group. 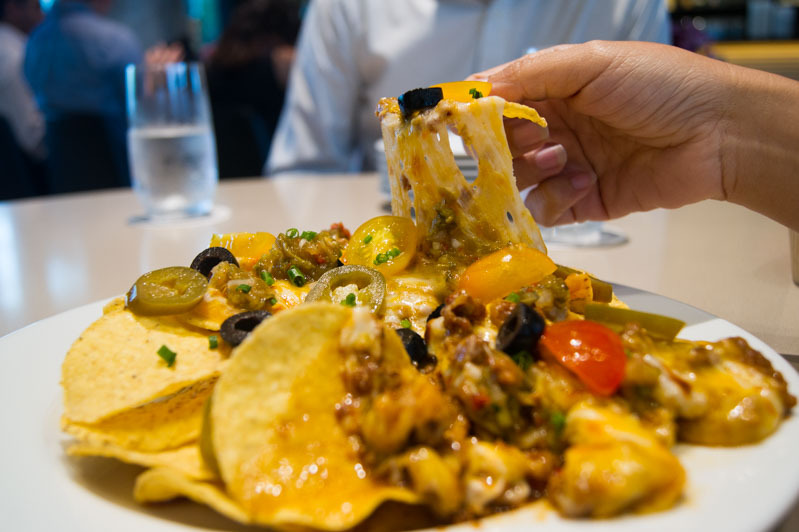 Located in Marina Square, this place serves dishes with a “Local Fun Dining” concept, at a pretty affordable price tag. 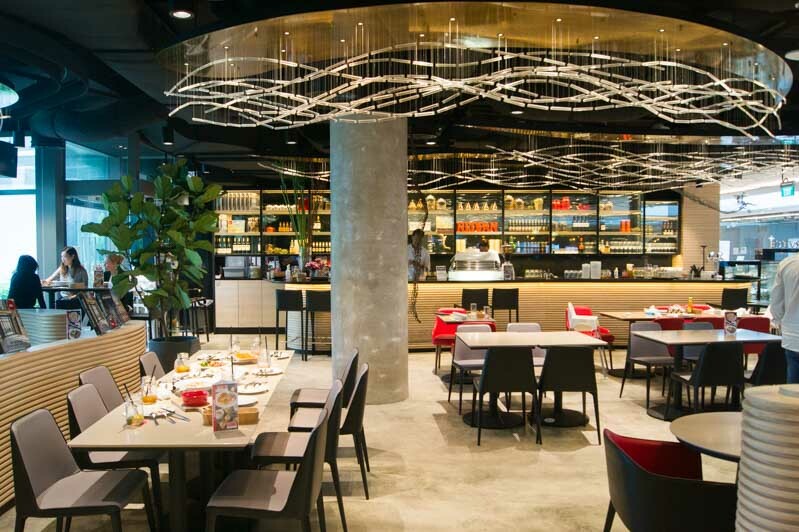 With DP Architects designing the interior of Redpan, you can be promised that you will dine in a place that is aesthetically pleasing for your photos (and maybe #OOTD too). In the restaurant, there is a small meeting space available with sound proof curtains and a projector for any private events. 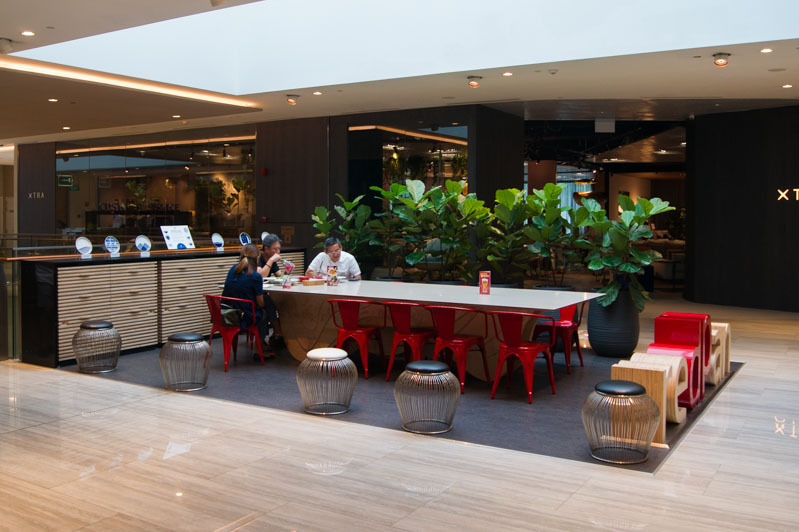 Beside the main restaurant, there is a well-lit indoor ‘garden’ space that’s suitable for a casual business meetings over food. Moving on to the starters, I had the Char Siew Chili Nachos ($9), which was a local play on the western version. The sweet tasting char siew ragout was mixed well with the melted cheese and jalapenos. While it didn’t taste a lot like char siew for me, it was still decent. 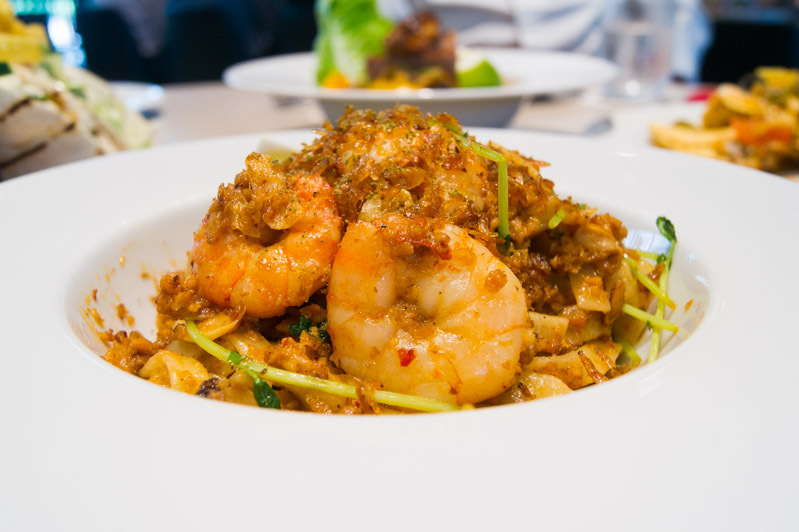 My favourite would be the Prawn & Hae Bi Hiam Pasta ($19), which was tagliatelle tossed with a house special hae bee hiam (spicy shrimp paste) base, pea sprouts and succulent prawns. This dish was garlicky with a lot of textures from the hae bi hiam that was well-mixed into the pasta. I haven’t quite had any pasta with a hint of wok hei (a flavour distinctive to highly heated wok-fried Chinese dishes), but this one hit the spot. 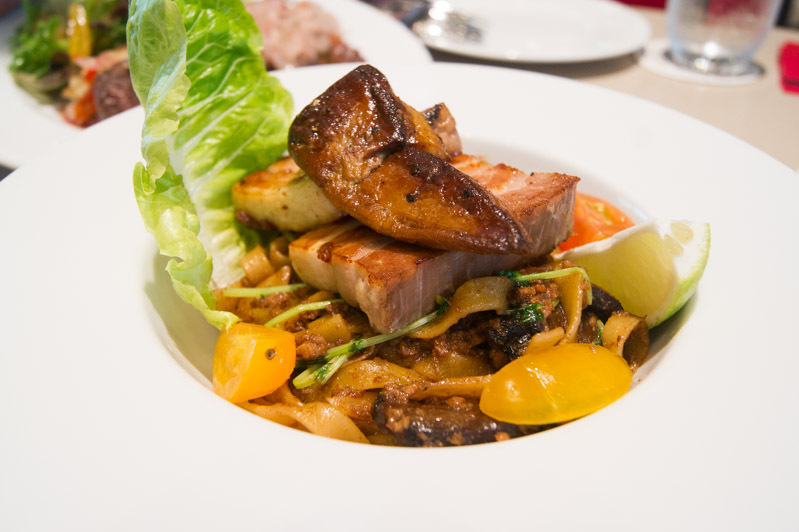 The Bak Chor Foie Gras Pasta ($19) was topped with two huge chunks of seared pork belly and a pan-seared duck liver, as well as the minced pork stew. The Bak Chor Mee staple of vinegared mushrooms were added to add some acidity to the dish. Overall this dish was nice, but I felt that the addition of tomatoes to be a little redundant and would much prefer if bits of crispy pork lard were added in instead. Another worthy mention would be the Seared Salmon In Laksa Gravy ($25) that had a crispy skin and moist flesh; a great sign of salmon done right. 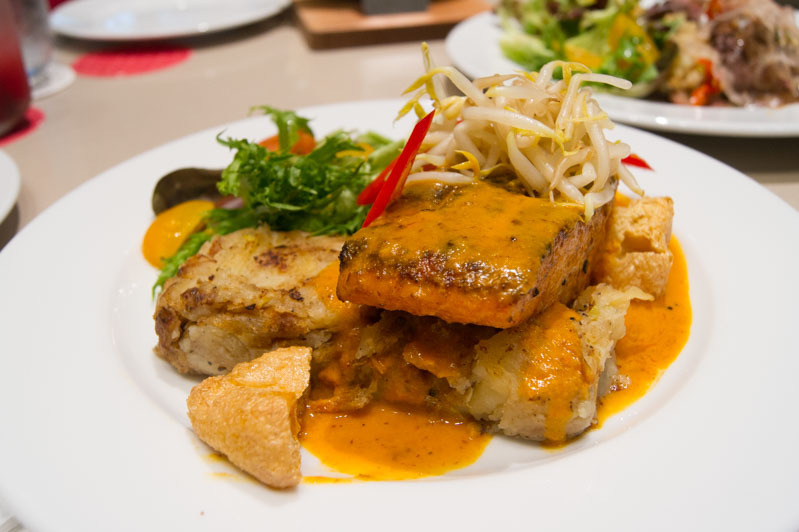 Sitting on a bed of leek-smashed potatoes, the salmon is paired with tau pok (crispy beancurd), beansprouts and of course, doused in the aromatic laksa (spicy coconut curry) sauce. The entire combination was very appetite-whetting and extremely innovative. I also tried the nicely charred Truffle Duck Confit Taco ($14), which was topped with deep-fried wonton skins that added a great crunch alongside the cucumbers and shredded lettuce. 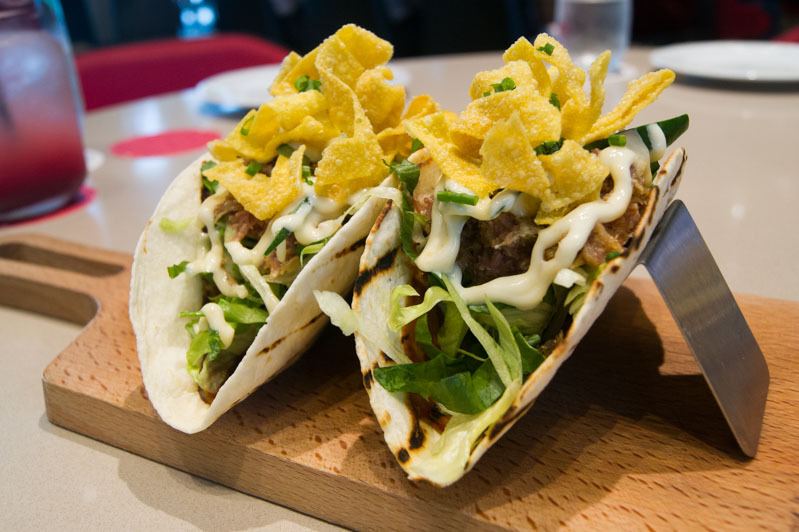 Asian-meets-Mexican cuisine, anyone? 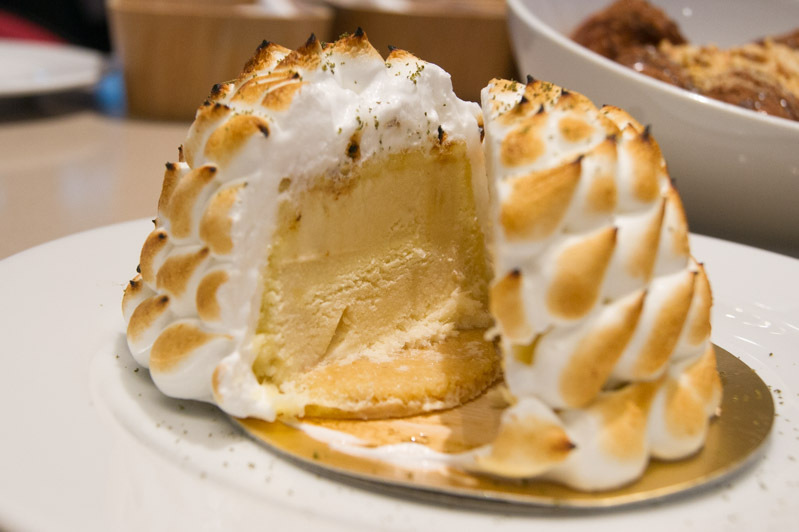 For dessert, I had the Durian Baked Alaska ($9). 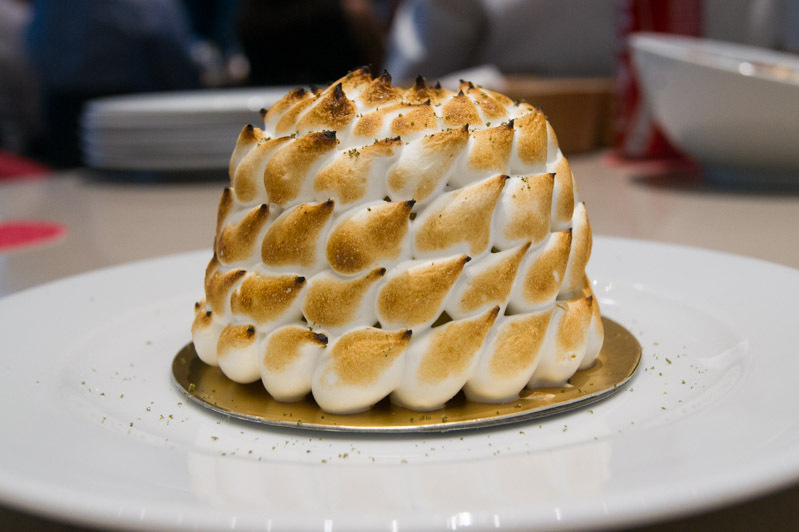 Reminiscent of the Esplanade building, this kaffir sprinkled dessert was a dome of durian ice cream encased in blow torched meringue, complete with a buttery coconut cookie base that complemented the durian flavour well. The taste was so tropical and creamy, a great end to a very contemporary local meal. 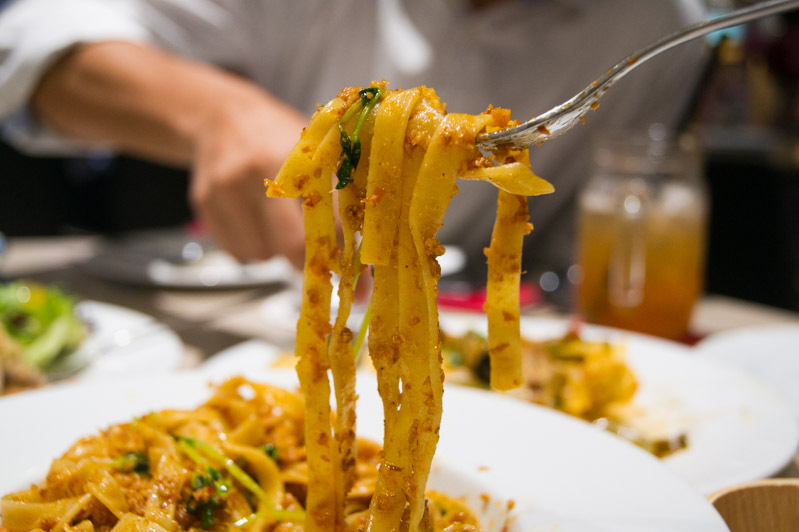 Unlike many places with atas and pricey local-inspired dishes, this place is actually quite wallet-friendly and the quality of the food is pretty great too. If you’re a fan of Asian-Western fusion and elevated local dishes, definitely give Redpan a try.